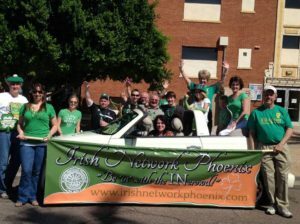 Irish Network Arizona will be marching in the 34th Annual St. Patrick’s Day Parade on Saturday, March 11 at 10 a.m. and you’re welcome to join us! We’ve been assigned slot number 35 and will meet at 9:30 a.m. between 3rd and 7th Streets, on St. Mary’s Blvd. (formerly Sheridan Street). There is a parking lot adjacent to Monterey Park and St. Mary’s Blvd at 2323 N. 3rd Street. Parking is also available at 1850 N. Central Avenue (Central & Palm Lane) and there is a free shuttle to and from the Hance Park from this location.